4 Reasons Why You Need Skin Needling! Skin Needling is an advanced skin, body and hair rejuvenation treatment which involves a number of microneedles penetrating the skin to trigger a natural healing response, resulting in an increase in collagen production. Microneedling will promote the natural production of collagen and elastin for a healthier, younger-looking skin. It is a less intrusive and far less downtime than other resurfacing treatments, whilst still delivering optimal results. Using no chemicals, Skin Needling (also known as collagen induction therapy) is highly effective at reducing acne scarring, body scarring, hair thinning, fine lines and skin texture. The underlying action of this treatment is to stimulate a natural reaction in your skin or hair follicles, to produce more of its own collagen and elastin. As well as releasing growth factors to start a rejuvenation process. 4- It is a treatment for the skin… and for the scalp! 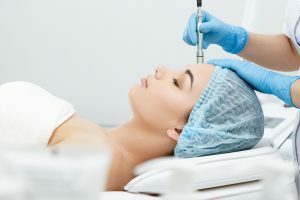 Skin Needling can also be used for hair rejuvenation. Microneedling re-activates the pathways in the hair follicle, activates a release of growth factors and stimulates the stem cells. The combination of these three actions helps to strengthen the hair follicle to support thicker, terminal hair. It’s important to prepare your skin correctly for this Advanced Skin Treatment. We recommend speaking to your professional Skin Therapist about what’s right for you.